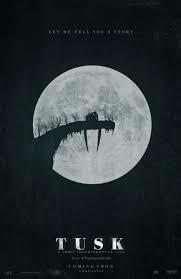 It was a hoax, but filmmaker Kevin Smith became obsessed with the idea, and from it was born Tusk. And oh dear. Oh dear, oh dear. So, to Tusk. There are a couple of podcasters, Wallace (Justin Long) and Teddy (Haley Joel Osment – yes, that Haley Joel Osment) who have hit the big time with their show “The Not-See Party” where they play online videos and mock them. After one episode on the Kill Bill Kid (think the kid playing with his light sabre, that very early viral video, but with more Tarantino results), the obnoxious Wallace flies to Canada to interview him, but finds that the kid has committed suicide. Pissed off, Wallace kills time in a bar hoping to find a new story, and it is there that he stumbles across the advertisement in the bathroom. He arranges to meet the man, Howard Howe (Michael Parks) and… then falls off the face of the earth. Neither his girlfriend Ally (Genesis Rodriguez) or Teddy can reach him, and enlist the assistance of Guy Lapointe (Johnny Depp performing some of his absurdist best).